After a scientific poll (I asked my wife.) I discovered that women like to hear, “I love you!” A lot! I also discovered when those words of love are written down they come across as more meaningful. Guys, how do you let the woman in your life know that you’re always thinking about her? After all, flowers can get expensive and too much chocolate can get old after awhile. Wouldn’t you like a cheap, effective way to show how much you love her? What would you say if this method could also bring some daily excitement into your relationship? Best of all, don’t you want a method that only takes a few moments each day? Sticky Note Love provides exactly that. It outlines a simple system that will help you tell your special lady just how much you love her. 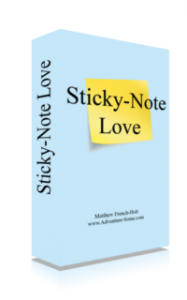 The Sticky Note System takes only a few moments each day, costs just a few dollars a year, and will have a tremendous impact on your relationship.